The annual rite of spring continues as Alaska Air Cargo flies the season’s first catch of prized Copper River salmon from Cordova, Alaska, to Seattle and points beyond. The first shipment arrived at the Alaska Air Cargo Warehouse at Seattle-Tacoma International Airport at around 7:45 a.m. Friday, May 15, 2009. University of Washington Husky Football Coach Steve Sarkisian ‘caught’ the ceremonial first salmon donated by Ocean Beauty Seafoods, then passed the 40-pound king salmon to the highest bidder of a KJR radio-sponsored charity auction. Alaska Airlines‘ Boeing 737-400 freighter touched down with fresh Copper River salmon from three seafood processors: Ocean Beauty Seafoods, Trident Seafoods and Copper River Seafoods. 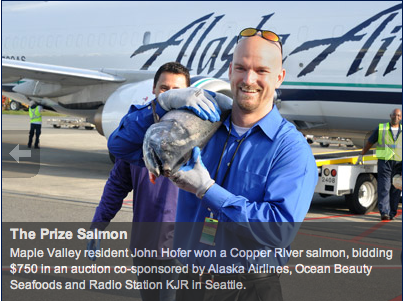 via Copper River Salmon Arrives | Alaska Air Cargo | Alaska Airlines Delivers This Season’s First Copper River Salmon. Next PostCordova Blogger Delivers Great Insight on Copper River Fishery. Copper River Salmon are just about as tastey as most Alaskan Salmon. The only difference is the marketing. If it taste better to pay more let me know and I got a lot of really expensive salmon.